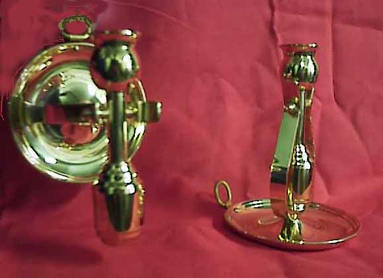 Hand Cast Brass Candlesticks: Works of Art! We are proud of our line of specialty heirloom quality brass candlesticks. They are not your ordinary candlestick, but finely crafted works of art. Individually cast by our master bell makers in the Darlana Folklore District of Sweden. Hand cast in sand in the centuries old tradition from pure high quality brass. Made in the same manner as our highest quality bells. (see Casting process) You won't see anything else like them! Dimensions: 260mm (10.23") high x 250mm (9.84") width. Made of high quality brass. Some parts are turned out from a solid bar of brass. Candle holding part swivels so that it can sit on a tabletop or be hung on a wall. Named for the fact that the candle stays upright (swivels) even in a rolling sea. Dimensions: 135mm (5.3") high x 120mm (4.7") wide at base.